Marine spatial planning is underway now, or starting, in many Pacific Island countries. This planning aims, amongst other things, to achieve the Convention on Biological Diversity’s (CBD) Aichi Target 11 which states, in part, that at least 10 per cent of coastal and marine areas are conserved through ecologically representative and well-connected systems of protected areas. However, means for countries, who have signed on to the CBD, to achieve an ecologically representative system of marine protected areas is missing. There are not perfect data which describe the distribution and abundance of every marine habitat and species in the Pacific. And certainly not at a scale that is useful for national planning in the ocean. Bioregionalisation, or the classification of the marine environment into spatial units that host similar biota, can serve to provide spatially explicit surrogates of biodiversity for marine conservation and management. Existing marine bioregionalisations however, are at a scale that is too broad for national governments in the Pacific to use. Often whole countries are encompassed in just one or two bioregions (or ecoregions). This report presents, for the first time, marine bioregions across the Southwest Pacific at a scale, which can be used nationally, as a basis for the systematic identification of an ecologically representative system of marine protected areas. Bioregions, of course, are just one of the important data layers in identifying an ecologically representative system of marine protected areas. To be truly ecologically representative and comprehensive, one must also consider all available information about habitats, species and ecological processes. In addition, socio-economic and cultural considerations are vital in the spatial planning process. This report is focused upon one important, but only one, input to marine spatial planning: the development of marine bioregions. To take account of differing types and resolution of data, two separate bioregionalisations were developed; firstly, for the deepwater environments and secondly for reef-associated environments. For the deepwater, thirty, mainly physical, environmental variables were assessed to be adequately comprehensive and reliable to be included in the analysis. 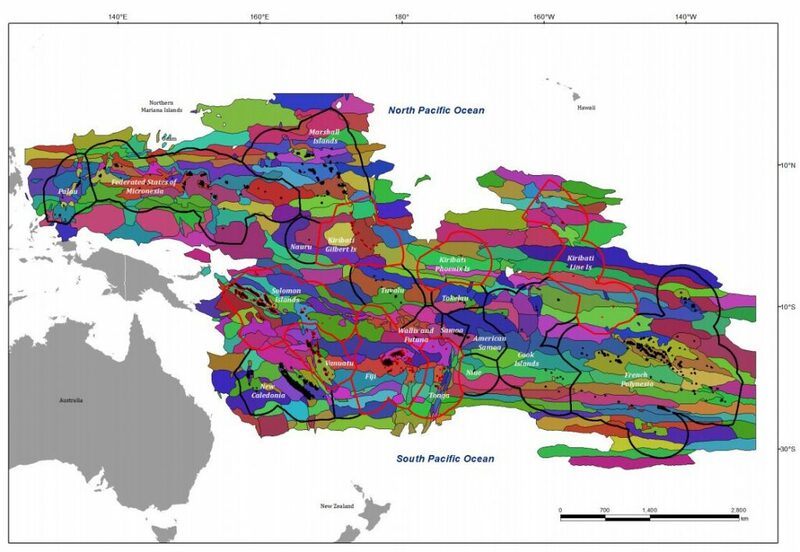 These data were allocated to over 140 000 grid cells of 20×20 km across the Southwest Pacific. K-means and then hierarchical cluster analyses were then conducted to identify groups of analytical units that contained similar environmental conditions. The number of clusters was determined by examining the dendrogram and setting a similarity value that aligned with a natural break in similarity. Draft deepwater bioregions for the Southwest Pacific including MACBIO countries (red solid line). The different coloured areas represent different bioregions. Because the colour palette available to us was not sufficient, some different bioregions may appear to be the same colour. For the second bioregionalisation, reef-associated datasets of more than 200 fish, coral and other invertebrate species were collated from multiple data providers who sampled over 6500 sites. We combined these datasets, which were quality-checked for taxonomic consistency and normalised, resulting in more than 800 species that could be used in further analysis. All these species data and seven independent environmental datasets were then allocated to over 45 000 grid cells of 9×9 km across the SW Pacific. Next, the probability of observing these species was predicted, using the environmental variables, for grid cells within the unsurveyed reef-associated habitats. Hierarchical cluster analysis was then applied to the reef-associated datasets to deliver clusters of grid cells with high similarity. The final analytical steps, applied to all the outputs, were to refine the resulting clusters using manual spatial processing and to describe each cluster to deliver the draft bioregions. This work resulted in 262 draft deepwater marine bioregions and 102 draft reef-associated bioregions across the SW Pacific. People’s expertise in the Pacific marine environment extends beyond the available datasets. An important, subsequent, non-analytical step, not described in this report, will be to review and refine the resultant draft bioregions with marine experts in the respective Pacific Island countries and territories prior to their use in planning.